1. 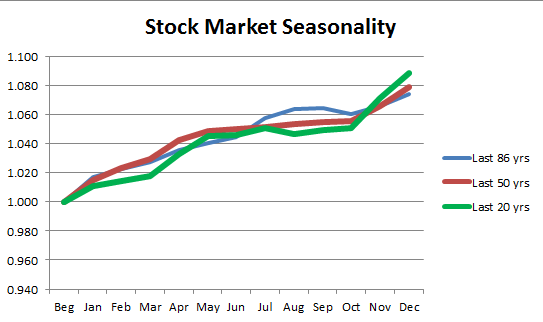 In all three periods, there appears to be strong seasonality. 2. October is the reflection point when the good season starts, while May is the reflection point when the good season ends. 3. Seasonality is strengthening. The last 20 years have stronger seasonality than the last 50 years, which in turn have stronger seasonality than the last 86 years. It shouldn’t be taken as a certainty that stocks will rise in the good season, it’s simply that the odds are good that they will. With that caveat in mind, if you have a bunch of cash sitting on the sideline, then October is a good month to start investing.